(Atlanta, GA) - This information comes to us via Guillermo Woolfolk at the Birmingham Craft Beer Examiner. He reports tht SweetWater Brewing is doing even more to support and raise funds for the Black Warrior Riverkeeper project. 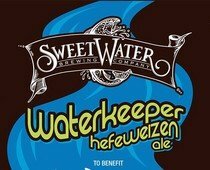 This time they are releasing a special beer called Waterkeeper Hefeweizen Ale. "Beginning almost a decade ago we began working with Upper Chattahoochie Riverkeeper to help them in their mission of protecting the river which provides clean water for millions of folks in the southeast (quite possibly you and definitely the brewery!) What began as donating cases of Sweetwater for fundraisers and post river clean refreshments turned into the Save the Hooch Campaign, raising over $250,000 to date for UCR’s mission. The success of the campaign has spread throughout the southeast to other local communities and their local Waterkeepers. Waterkeeper Hefeweizen continues our mission to raise awareness for Waterkeepers and assist them in their fight to preserve our rivers, streams, and coastlines. To learn more about our campaigns throughout the southeast, and to make a donation please visit: waterkeeper.org"
Black Warrior Riverkeeper's mission is to protect and restore the Black Warrior River and its tributaries. We are a citizen-based nonprofit organization dedicated to improving water quality, habitat, recreation, and public health throughout our patrol area, the Black Warrior River watershed. This vital river basin is entirely contained within Alabama, America's leading state for freshwater biodiversity. Patrolling waterways, educating the public, and holding polluters accountable has made us an important proponent of clean water throughout the basin. Our staff identifies major pollution problems and works on cleaning them up while increasing public awareness. Black Warrior Riverkeeper is a proud member of Waterkeeper Alliance.